No fish… no nothing. 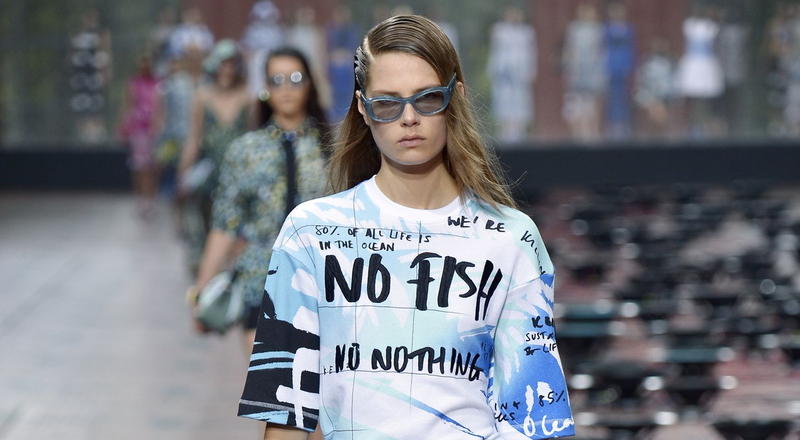 Kenzo once again turned the gazes of the fashion world to endangered oceans by unveiling a long-term partnership with the Blue Marine Foundation. The brand’s creative directors Carol Lim and Humberto Leon, who both grew up near the Californian coast, are no strangers to the issues endangering marine life, topics they already touched upon in the spring-summer 2014 collection. For Kenzo, protecting the oceans and fighting against overfishing and pollution became a personal mission, and Blue Marine Foundation (Blue) became an ideal visionary partner to help drive positive change. Based in the United Kingdom, Blue is campaigning for the protection of marine life, use of sustainable methods of fishing and creation of maritime reserves. The organization has already achieved impressive results, including the creation of the world’s biggest marine reserve on the Chagos Archipelago in the Indian Ocean. Its current mission is to ensure protection for 10% of the world’s oceans by 2020. Kenzo has already launched a capsule collection dedicated to the partnership. Proceeds from the sale of t-shirts, sweatshirts and tops bearing the “No fish no nothing” slogan are set to be donated to the foundation.